A bedroom can be attributed to a special room of a house or apartment in which apartment owners spend a certain part of their lives. However, in order for the bedroom to really reassure, as well as accompany silence and tranquility, one should pay particular attention to the choice of interior for this room, not forgetting even the smallest details. And based on the fact that, in principle, there should not be much furniture in the bedroom, the main attention should be paid to the wallpaper. Now it is quite easy to choose wallpapers for any room in the house. Fortunately, in the shops, at the moment, there is a huge selection of high-quality wallpapers of various colors and made of various materials. True, wallpaper wallpaper strife, so you need to decide what wallpaper to choose for the bedroom and what advantages or disadvantages this or that type of this finishing material has. What wallpapers are best suited for bedrooms? Each of these types of wallpaper has both its advantages and disadvantages, therefore, to determine which wallpaper is better for the bedroom, it makes sense to consider each type separately. 1. 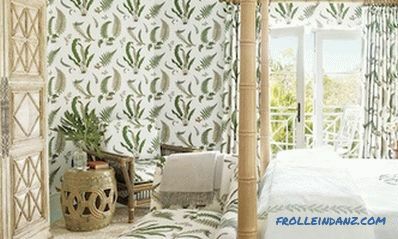 Paper wallpapers are considered to be the simplest, most environmentally friendly and cheap kind. Nevertheless, despite its apparent simplicity, paper wallpapers have a large palette of colors. Such wallpaper can glue the walls in almost any room. There is no exception and a bedroom. Meanwhile, the cheapness of such wallpaper affects their lifespan, which is very small. And in the sun paper wallpapers tend to fade. Therefore, when choosing a wallpaper, many people simply bypass them and try to choose what is more expensive. 2. Vinyl wallpapers are good because they are made of thicker material that easily hides the defects of wall panels. To stick such wallpaper will not make much work - they easily fall on the walls and do not give "bubbles". 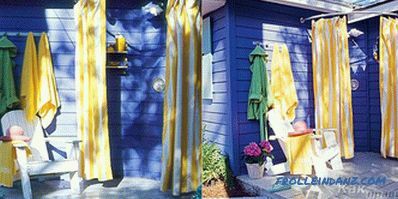 In addition, their colors have a huge amount, so vinyl wallpaper can often be seen on the walls of the bedrooms. 3. Non-woven wallpapers are more expensive than vinyl. Nevertheless, they are trying to paste over the walls of the bedroom those people who can not stand the same type and constantly want to change something. 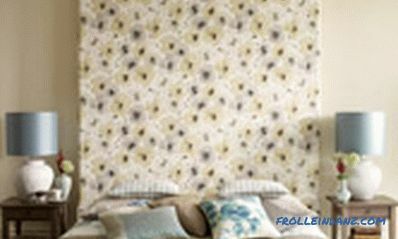 There are also non-woven wallpaper for painting, which is even more profitable solution, because in this case, you can create an individual bedroom design. The material from which these wallpapers are made, allows you to repaint them up to 15 times. If you do it more, the wallpaper will become unusable. 4. But the most popular, especially among those who have significant cash, are wallpaper on a fabric basis. This wallpaper is environmentally friendly, their choice in terms of quality and colors, is quite large. Fabric wallpaper suitable for those who are trying to use everything in the house naturally clean, not forgetting to emphasize at the same time, a certain wealth of the interior. There are quite a few options for decorating the bedroom using wallpaper, although there are quite favorite among them who want to make real beauty from their bedroom. Of course, all the existing options are unrealistic to describe, however, some of them are quite possible. 1. Combining wallpaper in a horizontal position. 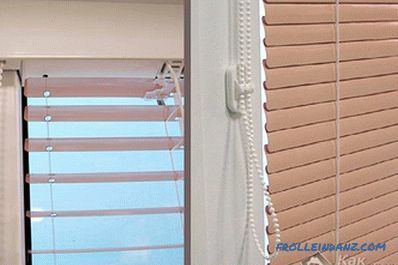 The use of this method involves the separation of the walls of the room into 2 zones. Moreover, the boundary of such a separation must necessarily pass either horizontally, or alternatively, diagonally. And each of these zones should be pasted different in their color or characteristics, wallpaper. In this regard, it is especially important to take into account colors and texture. That is, the upper zone is pasted over with wallpaper, in which the pattern is more saturated and bright. As for the lower zone, in this case it is revetted with wallpaper with a single-color pattern. In principle, it is not necessary when using this method to act as described above. However, it’s necessary to take something as a basis. 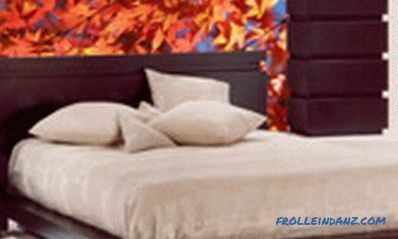 HORIZONTAL COMBINATION OF WALLPAPERS IN THE BEDROOM. 2. Decorating the plot at the head of the bed. 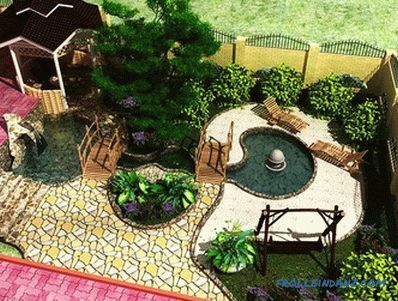 The use of this option allows you to select the bed among the bedrooms to show its importance. When using this option, you must select 2 types of wallpaper - with a pattern applied on them and plain. Plain wallpaper stuck to those walls that are not adjacent bed. But the wallpaper with a pattern pasted at the head of the bed. If necessary, you can try to experiment. Not bad will look in the bedroom at the head of the bed and wallpaper. 3. 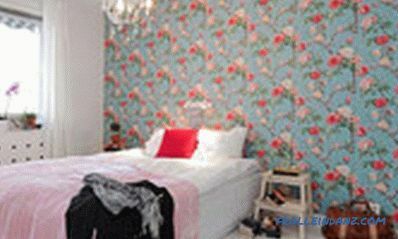 If the apartment owners have a certain designer fantasy, then they can try to combine the wallpaper in their bedroom. In other words, on each wall there will be wallpapers of different colors. In this way, you can try to divide the bedroom into zones. 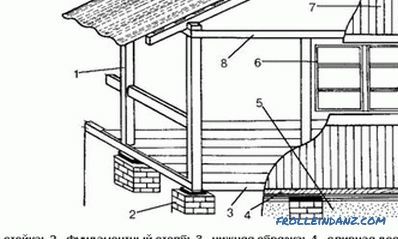 However, this method is very risky in the sense that here it is necessary to use the same texture and material. Otherwise, to tastelessness will remain, nothing at all. 4. If it is planned to make the bedroom such that it fully corresponds to one of the interior styles, then special attention should be paid to the wallpaper. T. o. if the bedroom is decorated in the style of Provence or Country, then it will look good in it, either plain wallpaper, or with a pattern of brickwork applied on them. 5. 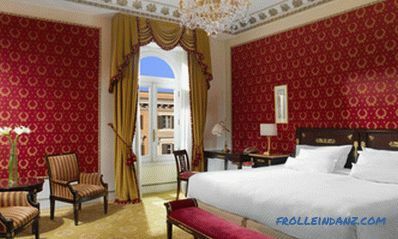 You can decorate the bedroom in the Empire style if there is a large amount of dark color on the walls, which can be used as a burgundy. A great alternative would be to decorate the walls with natural wood. You can try and large patterned pattern, which was once applied to the walls of the royal bedrooms. 6. Styles like hi-tech or minimalism make the bedroom a bit futuristic. In this case, it is best to use dark gray or white wallpaper in the bedroom. What is there to say - even black ones will do, but only if they are not the main, but additional ones, to single out individual zones. 7. In the bedroom of the antique and ethnic style it is best to stick light wallpaper. 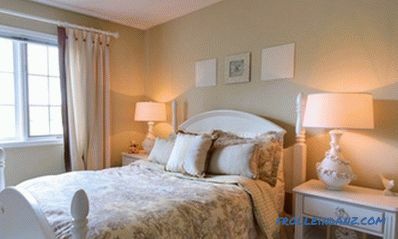 Under them it is quite easy to select the appropriate furniture and other items for the bedroom. 8. A Japanese-style bedroom will be very beautiful if the wallpaper resembles bamboo or wood. Alternatively, you can try plain beige wallpaper, but in this case it is desirable to put a sprig of sakura in a vase. It will be much better if the wallpaper of the bedroom walls is in neutral colors. For in this case, the bedroom will not look too defiant, so the "going to sleep" will be quick and quiet. To make the bedroom seem luxurious, it is recommended to glue its walls with seamless wallpaper on a fabric basis of warm colors. Such shades as beige, peach, blue, etc. will look good too. These colors are considered “classics” when decorating the walls of the boudoir. Wallpapers of this color do not hurt the eyes, they do not bother, and the furniture for them is easy to pick up. Designers and interior designers of premises strongly recommend using in the bedroom wallpaper of some tones, which will be very appropriate to look at the pictures in frames, pictures, shelves with souvenirs, etc. However, if you liked the wallpaper with pictures, then you should try choose such that the drawing would not be too large. Otherwise, the drawing will have a negative effect on the subconscious and will be difficult for perception. True, and wallpaper with small patterns in the bedroom will not look, because the room in this case will be visually reduced in size. If you choose striped wallpaper, then with their help you can visually make the bedroom longer. If the wallpaper stripe is vertical, then such wallpaper will allow you to make "above" the ceiling. In a word, do not be afraid to try and experiment. Moreover, the bedroom is made out not for someone, but for themselves. As for the wallpaper, their choice is so large that it’s easy to choose the most suitable ones for yourself and for your bedroom.